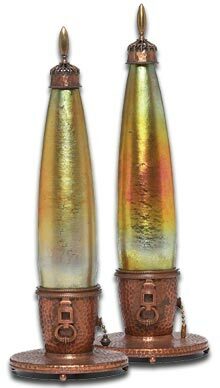 Collecting Arts and Crafts Glass provides the glass collector with a rich choice and a wide variety of artists. What is Arts and Crafts Glass – The name Arts and Crafts came from the Arts and Crafts Exhibition Society, set up in 1887 to show designers’ work in a range of materials. 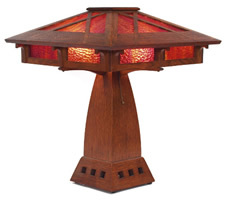 The arts & crafts movement began in the middle of the 19th century, and continued for some 50 years. It was a reaction against the extravagent, over-decorated Victorian taste and the worst features of factory mass-production. Arts & Crafts founding members included Walter Crane, William Morris, and Charles Robert Ashbee. They advocated good simple design made in basic, inexpensive materials but to a high standard. A few hoped to form an alliance between art and industry, to apply artistic design principles and use mechanised processes to augment hand production methods. But most of the arts and crafts advocates rejected mechanisation completely and sought to return to hand crafted work and medieval philosophies. They failed to change society in the way they intended, and some became very disillusioned when they realised that their beautiful designs were too expensive for the mass market and were only bought by the rich. Nevertheless their efforts had a major effect on trends in design, and led directly to many of the design features of the art nouveau period. In the USA, Louis Comfort Tiffany established his glass and interior design company in 1879, influenced he said by William Morris and following the Arts and Crafts glass tradition. Tiffany aimed to improve the standard of artistic taste and set up a studio which was intended to operate like a medieval workshop with Tiffany as the creative master craftsman and designer. In England Harry Powell, the grandson of James Powell, joined the family glass company in London in 1873 and became manager in 1875. Well educated and affluent, Powell knew the designers of the Arts and Crafts Movement and understood the middle class Londoners who bought their products. His company produced arts and crafts glass between 1880 and 1920 which was held in the highest esteem in Britain, Europe and the USA. Powell Glass at the Whitefriars Glassworks in Central London was England’s longest surviving glassworks. 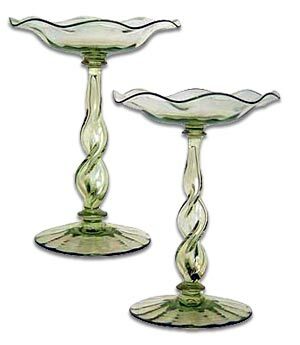 The Whitefriars hand blown glass work held to strong design beliefs which were often at odds with prevailing trends amongst glass manufacturers, but which nevertheless captured the spirit of the Arts and Crafts movement. In Scotland James Couper and Sons employed Christopher Dresser to design a series of glass vessels which they called Clutha Glass. These had random bubbles and colour streaks, and very unusual shapes which often combined flowing curves with angular or straight line features. John G. Sowerby, manager of the Sowerby Glassworks in the North East of England during the 1870’s and 80’s, was a close friend of William Morris and of Thomas Crane, Walter Crane’s brother. Morris was a frequent visitor to Sowerby’s home in Gateshead; and Sowerby and Thomas Crane collaborated on a successful series of illustrated children’s books. Sowerby was an artist who exhibited his paintings in the London exhibitions and then set up an arts and crafts glass workshop in 1871. 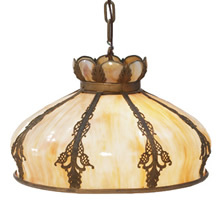 The workshop produced a line of Venetian style glassware in the style of the Arts and Crafts designs of the period. This was never promoted and was not widely distributed nor publicised. Sowerby also used popular Arts and Crafts glass designs, mostly illustrations by Walter Crane, as surface patterns for literally millions of small glass items like posy vases.